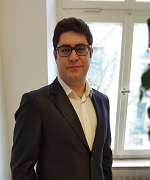 Say hello to our newest team member: Hakan Özalp! Hakan has joined the ISTO research team as a post-doctoral fellow this month. He holds an M.Sc. in Economics and Management of Innovation and Technology from Bocconi University and completed the Ph.D. program there as well. Hakan's major research interests lie amongst others in the fields of Industry Evolution, Technology Battles and Product Strategies & Performance.